Jackson, CA - One of the most spiritually nourishing events every year in the Western American Diocese is the Children’s Camp. 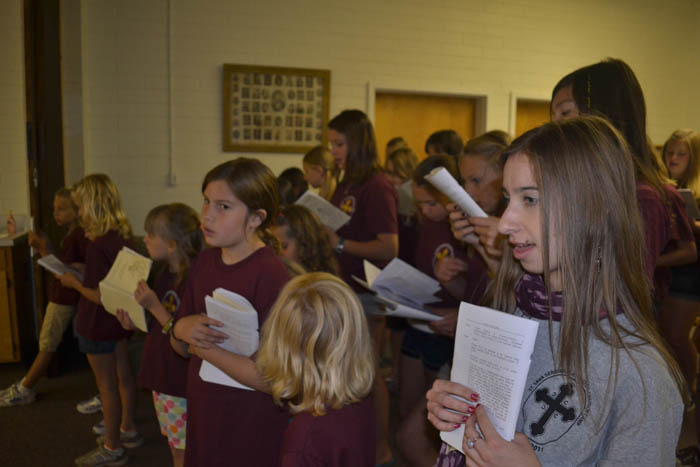 Organized by the Diocesan Camp Committee and held during the three weeks in July and August at the Saint Sava Mission and Retreat Center, in Jackson, California, this Camp always attracts many children from throughout the Diocese. St Sava Summer Camp begins each year after the feast of Petrovdan and continues for three full weeks. The first week is restricted to younger campers of elementary and middle school. The second and third week are open to campers who range from those entering the first grade to the twelfth grade. St Sava is Camp is a gathering place for members of all generations. It is not uncommon to have grandparents in the kitchen, parents as lay directors and children, and even grandchildren of the same family as campers. The campground is a home away from home. Camp councelors are most often former campers who are 'giving back' their time and talent to help today's campers. The camp program offers a daily regimen of church services: matins and vespers. Once a week, campers participate in the Divine Liturgy and Holy Communion, having fasted and offered a confession the day before. In this way, the camp sets a model for campers in their daily lives at home. The camp curriculum also addresses the cultural needs of the campers. The children are instructed in kolo dancing, folk singing and lessons regarding the history and culture of the Serbian people. St Sava Camp remains a place where life-shaping experience occur. Long-lasting friendships are formed at camp. This is also the place where future kumovi are discovered and sometimes where budding marriage relationships are formed. This year te first week gathered around 70 children from various parishes, accompanied with their instructors and the priests Fr Dusan Bunjevic and Dane Popovic. His Grace Bishop Maxim joined the Camp and extended his archpastoral blessings. During this week everyone had a wonderful opportunity to rejoice with the others, to share his or her experience, faith, love, compassion. The Church is the place of love, communion and joy because our Trinitarian God is Love, Communion and Joy! The last evening everyone is excited at the St Sava Mission Camp because the kids perform their Talent Show.